One of the most brutal battles in the American Civil War was fought for the control of Chattanooga, Tennessee. 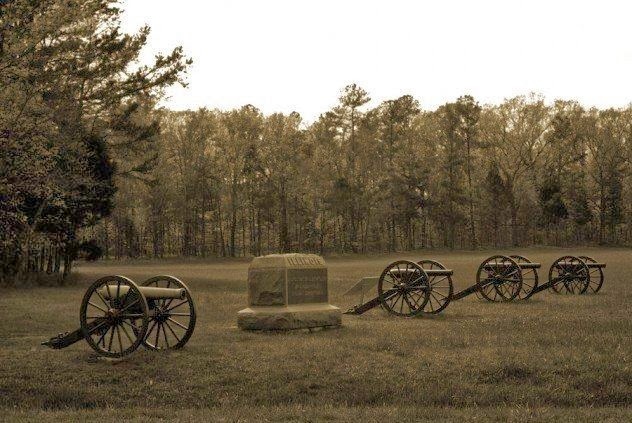 The main bloodbath of this battle took place in the Chickamauga battlefield. To make things worse, the site also witnessed the annihilation of the Georgia Cherokees by smallpox. Today an unassuming National Park, the area still carries a trace of these brutal tragedies: Legend says it is one of the most haunted places in America. The field is often encompassed by a mysterious fog that disappears as soon as the visitor exits the area. Eerie lights and ghostly figures have been seen moving about, and sounds of ancient combat have been heard. Perhaps the most frightening entity said to haunt the area is “Old Green Eyes,” a monstrous figure that stalks a particular hill. It’s a hairy creature with razor-sharp fangs and piercing eyes (that are indeed green). No one really knows what Old Green Eyes is. Some claim it’s a half-man, half-beast that is drawn to the site because of its murderous history. Others maintain that it’s a tortured specter whose twin brother was slain in the battle whereas some believe Green eyes was a soldier whose head was blown off during the battle and now he wanders looking for his body.